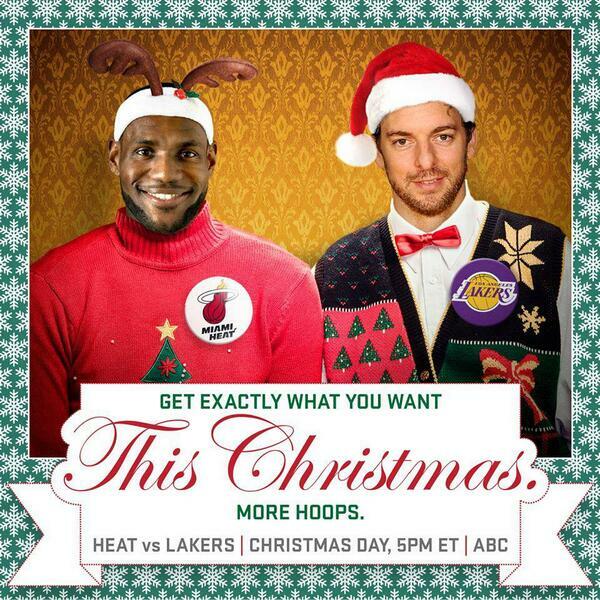 Merry Christmas and Happy Holidays from Hack-a-Shaq! Here's hoping everybody enjoyed their holiday. The last couple of games haven't been fun at all. The Lakers have looked awful against the Warriors and the Suns, getting beaten down by an average margin of 23 points and looking like the worst team in the league while doing it. That doesn't bode well for the Lakers with the defending champions Miami Heat coming to town today for the Christmas day match up. The Heat come into this match up with a 21-6 record and are one of the very best offensive teams the league has to offer, owning an offensive rating of 111.4, good for second in the NBA, while still being ranked 8th in the league in defensive rating with 103.2. Miami is scary, as they have the reigning league MVP (and the NBA's best player) in LeBron James. Miami is a team that likes to run, run and run and they will pressure the Lakers into their fair share of turnovers. The Heat aren't the biggest team in the league and struggle with rebounding, being ranked 30th (dead last) in total rebounding, but they are a team that passes the ball well, being 6th in assists, and shoots well from deep, shooting 38.1%, good for 8th in the league. For the Lakers to have a chance at stealing this game, they need to take care of the ball and take advantage of their size advantage; feed the ball down low early and often and create space by hitting their open three point shots. On defense, the Lakers need to make it tough for Miami; limit the amount of open shots the Heat have and contest any and all lay ups. The Lakers need to help on LeBron James and rotate to the open man, while strategically sagging off of Dwyane Wade from three point land, as he is a poor three point shooter and has only taken 79 three point attempts in the past two seasons, making 21 of them. The good news for the Lakers? Jordan Farmar is cleared to play and will start tonight. Do The Lakers Need Another Point Guard?